After an 11 billion dollar investment by parent company Geely, Volvo can now proudly proclaim technological independence from all previous collaborations with other manufactures. The latest offspring from this multi-year investment is a pair of motors in the new Drive-E line of powertrains, now labeled as the T5 and the T6. These four cylinder engines have been engineered with the express purpose of delivering maximum efficiency with minimal displacement. Not long after our stint in Las Vegas for the BMW M235i and 435i convertible, we headed back to Sin City to test out these new advanced powerplants in the 2015 V60 sportwagon and S60 sedan. Another substantial piece of news here is that after a short lapse, Volvo is again offering a proper wagon in the United States in the form of the V60. Volvo considers itself "the wagon company" and we'd be hard pressed to argue with that assertion, so a fair amount of Swedish pride is riding the on this sportwagon. These days it seems like nearly every vehicle that doesn't resemble a four-wheeled vending machine is being described as having a "coupe-like" profile, and even the V60 is not immune from this marketing trend. Whether or not the V60's design is coupe-like or not, it does cut a handsome and athletic figure that is certainly more car than SUV. Moreover, we're enthused to see another sporty five-door taking on a role which would have otherwise likely have been filled by the latter just a few years ago. Our V60 tester carried the T5 motor, a 2.0-liter four cylinder biturbocharged unit which develops 240 horsepower and 258 lb-ft of torque between 1500 to 4800 rpm. Paired with Volvo’s new 8-speed automatic transmission, the T5-equipped V60 can do 0-60 in 6.1 seconds while returning 25 mpg city and 37 mpg highway fuel economy ratings - admirable numbers by any measure, to be sure. Even in this "base" configuration, the gutsy four-pot was than capable of motivating the wagon's 3527-pound mass with commendable haste, though not without a slightly buzzy soundtrack. Nearly identical in terms of layout from the back seats forward, the S60 we also tested came packing the T6 motor and a healthy list of options from the Volvo spec sheet. 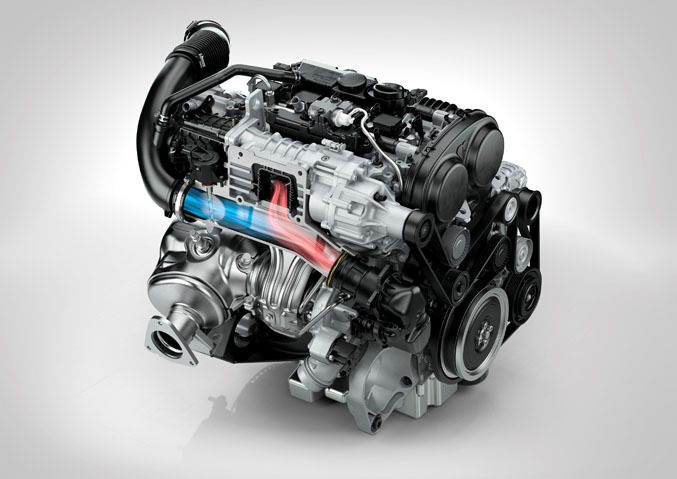 The T6 engine shares much of its design with the T5, but also includes a Roots-type supercharger to bolster low-end grunt, resulting in a peak output of 302 horsepower and 295 lb-ft of torque. This translates to a brisk jaunt to 60 mph from rest in 5.6 seconds, with fuel economy ratings only taking a slight hit at 24 in the city and 35 on the highway. The resulting immediacy of response from the added supercharger is gratifying and serves to make the car noticeably more engaging even while simply casually cruising around town, as the added torque gives the car a lively amount of pull across the rev band. While you won't find any fancy adaptive damping or magnetic ride control features here, in Dynamic chassis trim as both of our testers were, the V60 and S60 provide a thoroughly successful balance between compliance and handling response which is not unlike what you would expect from premium European automakers at a significantly higher price point. On more than one occasion we had the opportunity to see how the S60 handled especially unsettling portions of tarmac in and around the Valley of Fire State Park - sections in which we'd just tested another vehicle on the week prior. We repeatedly came away with the sense that the Volvos handled those challenges with just as much composure - if not more - than the more expensive (and more sport-oriented) offering we tested from Bavaria. It would probably be a stretch to call the S60 a corner carver, as both steering weight and feel are not implemented here with an intent for communication, and Sport mode only alters the transmission's shift points, but it's still a car that's capable of keeping you entertained should you call upon it to do so. Another aspect where these Volvo excels is immediately noticeable when you get inside. 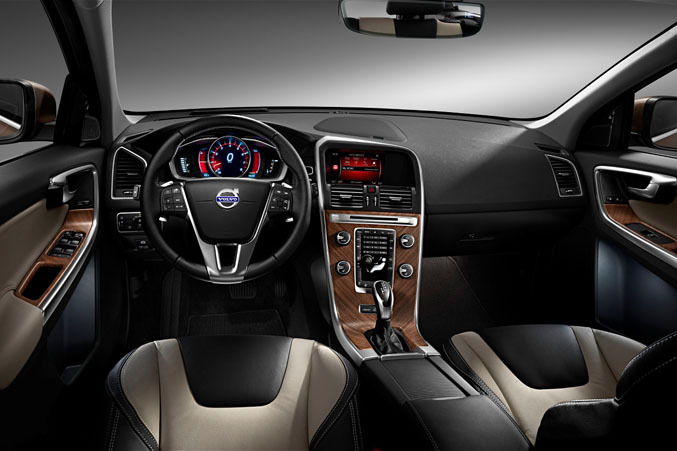 Beyond the high quality materials and sensible instrument panel layout, it must be said that Volvo's seats are some of the most comfortable and pleasing to look at buckets you can get today, especially with the two-tone leather found in our S60 tester. However, a point or two must be deducted for the hand-operated lumbar support adjustment knob - a downright archaic design whose annoyance is only compounded by the knob's placement between the center console and the side of the seat regardless of whether you're driver or passenger, thereby calling upon you to jam your hand down between the console and the outside of the seat bolster for a vigorous session of hand cranking should you desire some lower back support. Volvo assures us that this will be rectified by an electronically controlled adjustment soon. For most people, the Volvo brand continues to be synonymous with safety, and no one is more aware of this than Volvo themselves. It's clear that a large part of Volvo's current approach to safety involves avoiding accidents altogether, as a host of different driving assistants and warning mechanisms work in tandem to keep the driver informed of any potential danger before it becomes an issue. While perhaps intrinsically opposed to its intent, with all these safety features enabled, driving the car with any semblance of vigor not only becomes a cumbersome task but also legitimately distracting at times. With everything on, we were subjected to a torrent of ongoing warning information about any and all potential dangers, be them real or perceived. From constant visual alerts about parallel-traveling vehicles by the radar-based Blind Spot Information System and being scolded by the City Safety collision warning system - both by a KITT-like red light bar on the dash and audibly by a loud beep at any time we chose to pass slow moving traffic with any kind of vigor at within half a dozen car lengths of the vehicle ahead - to wrestling with the wheel against the Lane Keeping Aid if we accidentally changed lanes without using a turn signal, there was a strong sense that taking fun out of the equation whenever possible is the new definition of safety - and perhaps there's some logic to that. We have no doubt these features have a very valid reason to exist, but for drivers looking to do some dynamic motoring some of these systems may end up being more annoying than useful. Fortunately, any and all of these assists can be individually disabled should you choose. Volvo also tells us to stay tuned for news about the Polestar versions of the S60 and V60 later this year, which will come boasting a 3.0-liter biturbocharged six cylinder motor sending 350 horsepower and 369lb-ft of torque to all four wheels, Brembo brakes, a beefed up suspension, and revised aero. When those two land in dealerships, parent company Geely's desire for Volvo to compete toe-to-toe with the likes of Audi and BMW will be that much closer to a very real proposition. The V60 and S60 may lack some of the sophistication and "prestige" that those brands enjoy, but prestige is only built by the exclusivity of a superior product. In that regard, the Germans would be wise not to rest on their laurels.